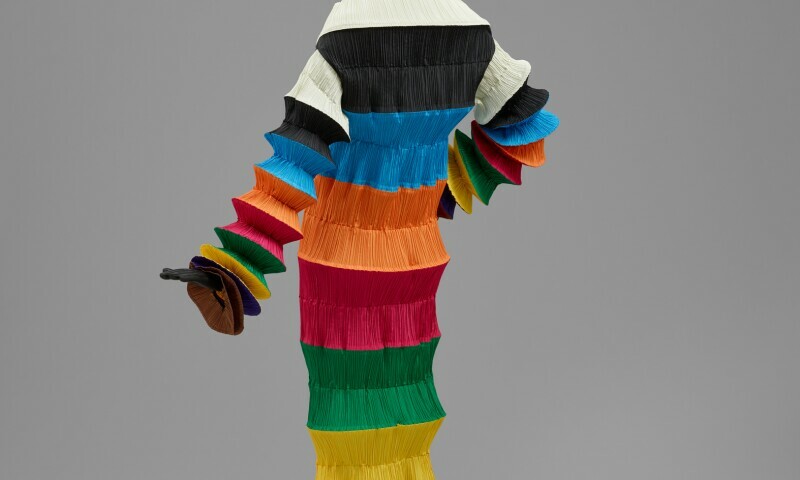 Issey Miyake, Woman's Flying Saucer Dress, 1994. Over seven decades of style will be displayed in Fabulous Fashion: From Dior’s New Look to Now, a major exhibition highlighting creativity and glamour. The haute couture and ready-to-wear garments and accessories on view range in date from 1947 – the year of the introduction of Christian Dior’s revolutionary “New Look” – to recent ensembles by audacious designer Bernhard Willhelm. Featuring some of the most significant and visually compelling works from the Museum’s renowned collection of costumes and textiles, Fabulous Fashion presents many new acquisitions and other outstanding works, exhibited rarely if ever before. Fabulous Fashion includes such iconic works as Adrian’s 1947 velvet “winged victory” gown, an understated black and white 1972 Chanel suit, and Geoffrey Beene’s 1994 silver lamé “Mercury” dress. Radical design is exemplified by Paco Rabanne’s dress made of plastic discs linked by metal rings (from his 1966 collection entitled “Twelve Unwearable Dresses in Contemporary Materials”) and a punk-inspired ensemble by Zandra Rhodes from her 1977-78 “Conceptual Chic” collection.